The following is an example of planning work completed by PortSide in 2011. This was not created at the time due to Parks permitting issues, then the interruption of hurricane Sandy, followed by our own search for a new home and more. 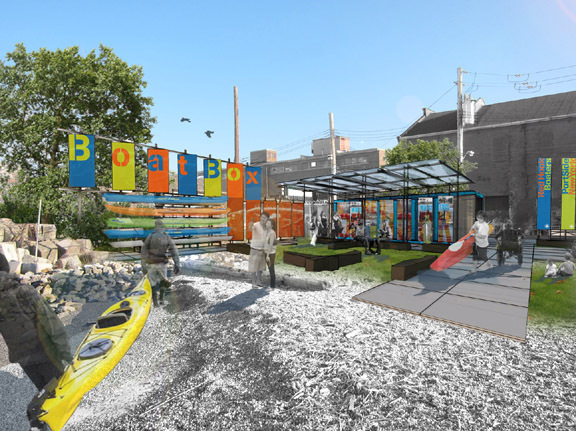 Get in touch if you want to help fulfill the vision of this BoatBox upgrade to the plain shipping container where the Red Hook Boaters store their kayaks in Valentino Park. This will also create a prototype for similar boating programs in NYC. This work was possible thanks to pro bono design services PortSide won via a desigNYC competition. During the time of the desigNYC project, PortSide's team solidified the form of the architectural design and content concepts were established. The 2D design would commence in the next phase. The interpretive graphics here are only placeholders and do not represent the final 2D design. 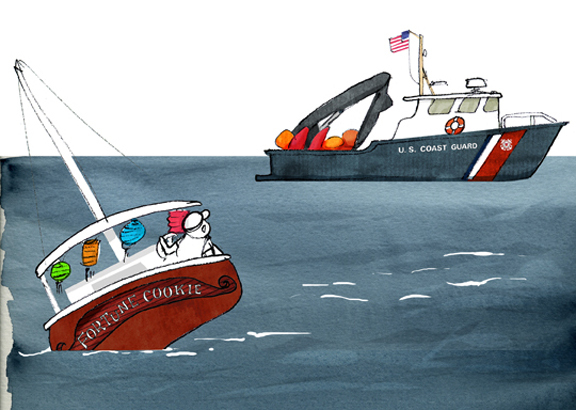 In several sections, we would like to use illustrations by Christina Sun who has a harbor blog bowsprite. She is a kayker who has worked on a survey boat and a ferry. Many of her illustrations are on our Waterways Info page. Provides boat rack where visiting kayakers can lock up their boats and visit the community, a hardware version of the Kayak Valet service that PortSide inaugurated in Valentino Park that is now practiced citywide by kayak groups. Design is modular. Position of elements can be shifted for BoatBoxes in other locations. 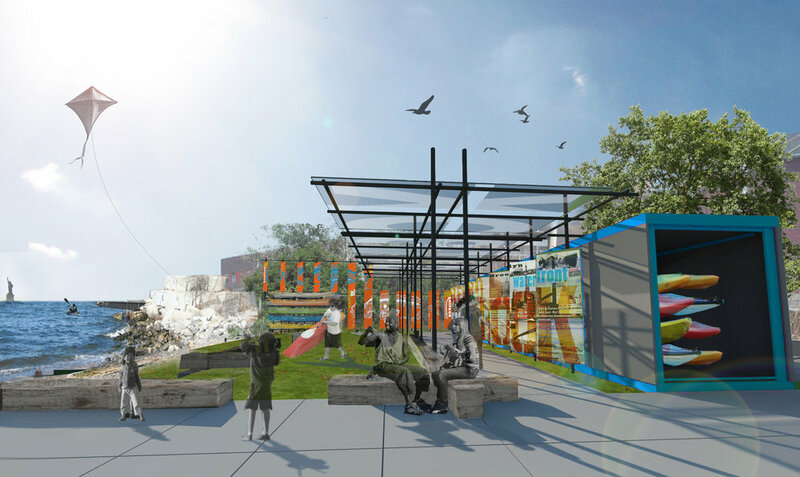 The angled panels on the BoatBox side will show a super graphic to visitors entering Valentino park, and the other side provides detailed content to be read up close. Safety info: (in Spanish and English) community flood preparedness information (so important post-Sandy), how to boat safely near commercial shipping and strong currents, the risks of eating fish caught in the park and to prepare the fish more safely for cooking. History from our e-museum Red Hook WaterStories. Want to know which fish to avoid eating? Click links in the chart below from a NYS Department Of Health guide to get enlarged photos. Please download the full fish safety guide (in English, Spanish and Chinese) to get more information on how to clean and cook fish to avoid contaminants and more. La tabla pertenece a una guía que contiene información acerca cómo limpiar y cocinar el pescado para reducir sus contaminantes. Está disponible en español. La razón principal para no consumir pescados y mariscos que provienen de aguas de Nueva York es su contenido de químicos como PCB (bifenilos policlorados), dioxina y cadmio. Estos químicos se acumulan en el sistema de la persona que ingiere el pescado y a largo plazo pueden causar cáncer o defectos de nacimiento en los niños. Le recomendamos que se informe acerca los pescados que se pueden consumir y cuales se deben evitar. Vea los avisos pesqueros del Depto. de Conservación Ambiental (DEC) y de la Agencia de Protección Ambiental (EPA). ¿Busca saber qué pescados evitar? Presione los enlaces en la tabla para una imagen más amplia del tipo de pez. Boating safety info is needed due to fast currents and heavy commercial marine traffic nearby which includes huge cruise ships and container ships, tugs and barges, and high speed ferries. For more safe boating info, see our waterways info page.